I don’t have passport but have plans of getting one since we’re going to travel in October. But something came up and Sean and I need passport as soon as possible. Based on the application form (at the back), you can have rush passport for 7 working days. So I thought I could get one in two weeks time. But heck! Walk-in applicants are no longer entertained. No appointment, no processing. 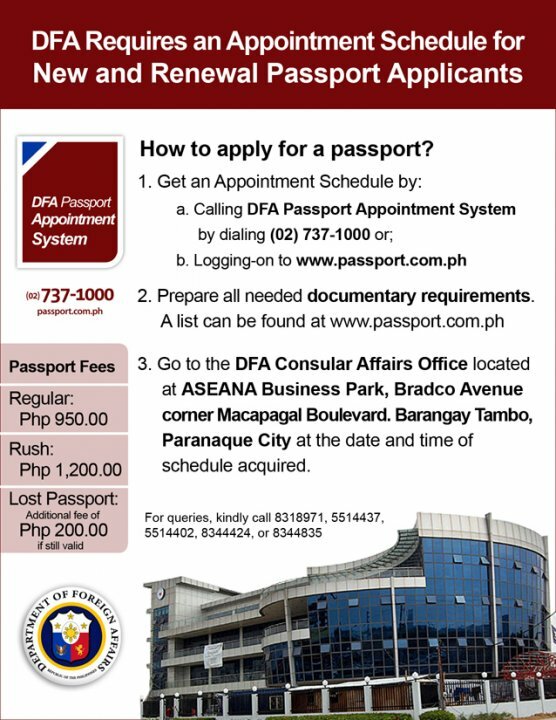 All passport applicants should set an appointment with the DFA first. The Department of Foreign Affairs (DFA) Saturday reminded passport applicants to schedule an appointment with the DFA to ensure that their applications will be accommodated. The DFA’s new Office of Consular Affairs (OCA) building near Mall of Asia will be open Monday, thus decongesting the DFA Main Office (along) Roxas Blvd., Pasay City. “Only those with confirmed appointments will be accommodated at the new facility,” the DFA said. I’m fine with the appointment system and I prefer it that way. It speeds up the process as applicants would be pre-processed using information given online, thus eliminating long queues formed with the old walk-in system. Less hassle. You don’t have to queue for hours while waiting to be attended to. But my problem is, when I set the appointment yesterday, the earliest possible schedule date is already May 12. Called the Passport Information Center to ask if I could get earlier sched and I was told it’s not possible. We won’t be accommodated if we would go there ahead of our appointment date. They will only allow if it’s for emergency purposes. Of course I understand that, so I have no choice but go as scheduled. The reason why Sean and I need passport in two weeks time is that my hubby will be in Singapore next week and will probably stay for two more weeks. He is on board a chemical tanker ship headed to Singapore for dry dock maintenance. He said some of his co-workers’ family would go there to visit, so he was asked if we are going too. He said not coz we’re saving for our planned travel on October. But suddenly he changed his mind and told me to process our passport so that their company can arrange for our visit. Their company will coordinate with the vessel principal so the agent from Singapore could pick us up at the airport. But now, how can we go to Singapore if our schedule in DFA is on May 12. Plus 10 working days for rush processing of passport. So it’s more likely that our passport will be released few days before June. I don’t know anyone who works inside DFA. If only I know one, I badly need his help. I read somewhere that if you have a friend or if you know someone who works inside, passport can be released in few days time. I don’t mind spending few more bucks naman. Kaso nga wala naman akong kilala. Wow! You’re going to Singapore? That’s nice. Pero sana makakuha kayo ni Sean ng passport just in time for the trip. Aba, at aalis din kayo sa October? Mukhang puro abroad ang target nyo ah. Kami naman, puro Pinas muna iikutin namin ng family ko. Complicated kasi mag-travel abroad kasi kailangan pa ng passport. Kakatamad! Hehe. Plano rin namin na dalhin si Greg sa Disneyland (Hongkong) sa 7th birthday nya. May 3 years pa lami para mag-ipon. LOL. Unplanned trip itong Singapore. Pero di na matutuloy coz I can&apos;t get passport earlier than May 12. So Hongkong na lang. Plan din namin pag 7 years old si Sean pupunta ng Disneyland. Uuwi ate ko sa October pupunta ng HK, treat nya daw kaming magkakapatid, so syempre go, mas mapapa-aga ang Disneyland trip hehe. Good luck sa trip nyo sa October. Ganun ba, kelangan na may appointment sched pag kumuha ng passport. I remember mine in Davao, ang bilis and me and my colleague were lucky that time cos the man who entertained us was very kind. And you know what, because of his kindness, we tried to give him "tip" but he declined. Kaya sobrang hiya tuloy kami ng kasamahan ko. Then he said he would appreciate it if we could send him chocolates na lang. Na-impressed talaga kami sa employee na yun. OO iba na kasi ngayon, mas maganda na rin para iwas fixer kaso di maganda sa case ko ngayon haha. Pero okay na, it&apos;s not meant to be lang talaga na makapunta kami ng Singapore now. Ang bait naman ng employee na yun, sana ganun lahat esp govt employee ano. I was able to search for someone to help me with my passport problem, pero di ko afford ang rate nya for 2 passports. Yun daw kasi ang rate nila sa loob. Obviously, may kakilala sya sa loob. Pero my gosh, mas mahal pa sa gagastusin namin, kaya wag na lang. Most of his clients are chinese na gustong magkaroon ng Philippine passport. I think this is much better na rin. Kasi, mamiminimize ung mga fixers headache ng mga applicant. No need dumaan sa mga harrasment ng fixers na kesyo kailngan ng gento ganyan para sa application, so this time, pag may appointment ka na, pasok agad sa loob diba? I agree, much better talaga ito. It just so happened that it doesn&apos;t apply to me now. But I have no choice kaya go on with the flow. Nasa Singapore na nga sila now. Marami na rin sa ibang kasama nya ang hindi natuloy coz of passport problems nga. Tska ayaw daw sagutin ng principal ang insurance ng visiting family, natakot, ang dami kasi. Nagtitipid na siguro, hehe. Pano kasi yung principal nila paid $5M++ when one of their tankers were hijacked by Somali pirates last year. Buti na lang di on board hubby ko dun when it happened. Anyway, for the meantime, &apos;pinanood&apos; ko ang Singapore through wikimapia at google earth haha. Hi there! Stumbled into your blog while googling about DFA’s appointment system. Too bad about your Singa trip. I just booked an appointment for my passport renewal and the earliest date I could get was May 21. Goodness. And I just heard in the news that the processing time doubled for some reason. Oh well. Let’s hope they iron out the process inefficiencies by the time we attend to our appointments. Thanks for visiting and commenting. Sayang nga yung Singapore trip pero it&apos;s not meant to be talaga. Now, first week ng June na ang available sked. Dapat pala i-sched ko na rin sister at mom ko for our October or November trip. I heard nga may problem sa processing, yung nabasa ko sa isang forum, nag pa rush passport sya supposedly makukuha nya march 30 pero april 10 na wala pa kasi nagka problem yata sa loob. baka naman pede magbago ng appointment date? Yung sa akin din kasi nung nag-set ako ng appoint wala ng available ng april kaya nag MAY 24 ako, ngayon tinignan ko ulet at may available ng April.. asar.. pede kayang mag pa-schedule ulet?? Maybe you can try Ivy&apos;s tip mentioned below. May nabasa na rin ako na ganun sa forum, they were able to re-schedule their appointment on earlier date by setting an appointment ulit. Minsan kasi may lumalabas na earlier date na hindi naman available dati katulad nga ng sinabi mo. Try scheduling ulit, sana may available pa ulit na April. hey.. i don&apos;t know if this might help but if i may: you can try to rebook your appointment again and again online cause some of the earlier dates open up. at least that&apos;s what happened to me. the first time, i was scheduled for the second week of may and then i tried to rebook — lo and behold, a date for the last week of april became available. i don&apos;t know if it&apos;s a glitch in their system or what. also, your previous appointment gets replaced by the new one you make, so no worries of having booked double appointments. it&apos;s a safeguard in their system – a good one i think. good luck! Thanks for your input Ivy. Possible nga yun I read in a FemaleNetwork forum na they were able to re-schedule on earlier date through the method you mentioned. Try and try lang talaga to re-sched. Good for you, you were able to rebook your appointment. I tried a couple of times then pero May 12 onwards pa rin talaga nakukuha ko. I guess I was not lucky. Since hindi na natuloy yung Singapore trip namin, hinayaan ko na lang. Yeah, visited that too. I sent you a message kanina ah.